Rev Lythan Nevard is Minister for Cranbrook. She comes from the United Reformed Church, most recently working in Torbay. Cornerstone is part of an ecumenical project funded by the Methodist Church, United Reformed Church and Church of England. ‘Part of’, because the paid role is that of Minister FOR Cranbrook rather than OF Cornerstone. This a very exciting distinction both for the minister personally and for the Church. It says to the community that the Church wants to reach out and be a part of all that is going on. 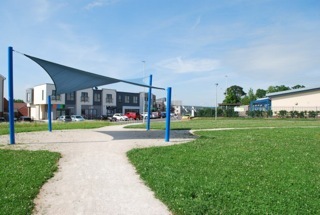 Cornerstone has set up and still runs many community groups, from running to Board Games and Film Club. And those who are part of Cornerstone have also helped develop other new community groups as well – the Cranbrook Bikers and Elderberries (for the over 50’s) for example. Cornerstone is at the heart of community identity and engagement and we continue to feel that we are “Blessed to be a blessing”, sharing God’s love as we develop relationships with our neighbours. We are looking forward to the time, hopefully in 2018, when the plot of land (in the picture) earmarked for a building will be handed over to us to become, not a church of bricks and mortar but a community garden project and open air worship space. Worship will continue in St Martins School and we are making links with the new Cranbrook Education Campus with a view to occasionally worshipping there as well. Cranbrook is growing at a rapid pace and being a church without a building in an unfinished town helps us to respond to the changing needs – to be the Church of Christ for the community in which we live. 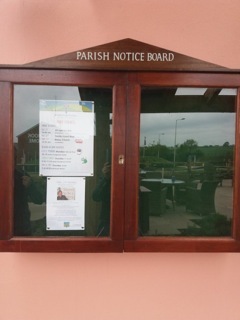 The manager of the pub in Cranbrook has kindly given us the church’s noticeboard, another sign of our role at the centre of this growing community. The minister spends time there building relationships and held the Christmas Eve communion there in 2017. You can read more about Rev Lythan and her work in Cranbrook here.